Sorry, we don't do seasonal rentals! Please don't ask, as it affects our position on VRBO when I decline. 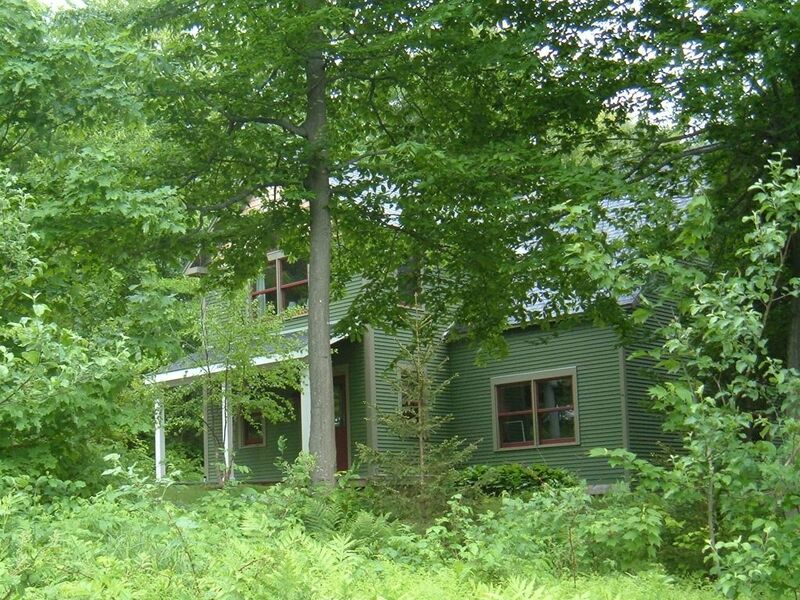 We welcome you to the SNOWS NEST, a short term rental vacation home (no seasonal rentals) available year round in Vermont's beautiful Green Mountains. No matter the season, this is your base for weddings, graduations, reunions, cultural activities or athletic competitions, sports, or as just a fresh air getaway for you and family/friends. We have everything you reasonably need. Just pack your clothes, pick up some groceries and you're all set. The house is fully equipped, not only with necessities, but with books, games, videos, toys and yes, a blender. Three good-sized bedrooms sleep six, two bathrooms, air conditioning, large rear deck with with a full retractable awning, covered front porch, fully furnished, 3.5 acres with diurnal pond (good for frogs, not for swimming). Off beautiful Common Road east of town. Views to the west. Please look at the pictures, as they say it all, it's very livable. Our home is designed for YEAR ROUND fun and relaxation; for family and social gatherings. Open floor plan, warm tones, radiant heat floors, gas-burning fireplace. Appliances include gas stove, d/w, microwave, full w/d. Air conditioning. This house has been continually upgraded every year since we bought in 2008. Even if you've been before, chances are you'll find something new. If you MUST work while on vacation, we offer DSL Internet with WIFI for your own computer. YOUR CHILDREN AND FLEA-FREE, WELL BEHAVED PETS ARE WELCOME. We strongly discourage smoking, but if you must, outdoors ONLY, and dispose of butts appropriately. We regret that the longest stay we can offer is six weeks, and would not include full months in the winter, as we use the house ourselves occasionally. We welcome inquiries from three nights to six weeks. Keywords: single-family, home, ski, nature, foliage, outdoor, family, pet, dog, peaceful, getaway, sports, wedding, reunion, graduation, reunion, arts, athletics. Cosmo, Moxie, and all the reillys welcome you. Animals rule! We love well-behaved, flea-free pets with the exception of some dog breeds (sorry, our insurance requires it). We realize there are good dogs and bad dogs out there of every breed, but the following breeds are generally acknowledged to carry the greatest risk ...pit bulls, akitas, rottweilers, chow chows, presa canarios, or any wolf/dog combination. Mixed breeds are fine (who doesn't love a mutt). We don't aim to be the fanciest house, but then, do you want to tiptoe through a showcase property, or let your kids and dogs off their leashes? We DO aim for comfort, convenience and fun. The entire house is planned to be a walk in/walk out operation - just pack your suitcase, and stop at the grocery store, everything else you need is here already. It is clean, and furnished specifically for family and social gatherings. Enjoy the unspoiled and varied scenery for dog walking, biking, or just kick back on the front or back decks and watch the wildlife. Waitsfield can cover all your shopping needs. Sorry, no rentals longer than six weeks. toilet, combination tub/shower, Huge tub! toilet, shower, Shower head accommodates very tall people. Upstairs bathroom has an enormous tub and shower. Downstairs shower stall accommodates people up to 6' 8". You are 2.5 miles from downtown Waitsfield with shopping, restaurants and entertainment. Sugarbush Ski area is actually a year round resort; a great destination for swimming, golf and tennis. You are 3.5 miles from Warren Village, quaint, good for shopping, antiquing and great food. See the major ski areas. Better view in fall/winter. You are in the midst of the Green Mountains. See Camel's Hump. (3) Local calls; no charge. And most cell carriers work well up here. We have a dial telephone from the 1940's that still works, in addition to a cordless unit. The house is an efficient 1650 sf. For A/C, we installed Fujitsu splits upstairs and down. And there is an extra window air conditioning unit if needed. And fans. The house has several heating sources, including radiant floor heat, baseboard heat, not to mention the gas-burning fireplace! You will be cozy. All bed linens are provided and we prefer you use ours to bringing your own. Everything is washed and ready for you. Beds are made up. Plenty of blankets and extra pillows. Full size. And we generally have laundry detergent on hand. Our driveway can easily accommodate 4 cars. Of course! All connection information clearly displayed. Large combined living/dining, high ceiling. Open floor plan. Full size: Easily large enough to roast a 20 lb turkey. Yes, and a grinder for beans. There are almost always staple items, like spices, salt/pepper, oils and vinegar, left by other tenants. So you don't have to buy all that stuff. Custom wood cabinetry. Coffeemaker, toaster, juicer, blender, griddle and absolutely everything to cook and serve with ... walk-in pantry. French country table and six sturdy Windsor chair, with cushions. Two; one in living room, the other in the master bedroom. An eclectic selection of sc-fi/fantasy, works by several popular authors (e.g. from Michael Crichton toJohn Grisham), and some more offbeat reading you may not recognize but we like it. There are several "stations" on the cable TV dedicated to a variety of music genres. Stuffed toys and Lego trucks, goofy stuff. Crayons, markers, scotch tape, construction paper, etc. And board games for kids and adults. A selection of films for all tastes. Two huge flowering beds adjacent to house, in bloom May - Oct. Yard and paths in the meadow are mown. Most of the 3.5 acres are woods/meadow. Our diurnal pond has frogs and salamanders in spring. Large, with western exposure. AND, the largest size motorized retractable awning available. A glass table with chairs, chaise longues and teak furniture, also Adirondack style chairs on the lawn. Can rent nearby. Mad River Glen, Sugarbush and Sugarbush North, and cross country skiing all accessible. A bit further are Middlebury and Stowe. And cross country too, at Blueberry Lake and around. This house is not a good choice for people who have trouble with stairs. Unless you are looking for KFC, Olive Garden or MacDonald's, the Mad River Valley has pretty much anything you could want with spa massage therapy, boutique coffee shops, tasting rooms, art galleries, local theatre in two venues, organic food shops, and the mundane but sometimes necessary gas station, hardware store, garden center, etc. A very cool movie theater. Check it out! Our family of 4 had a wonderful long weekend for family time and skiing (downhill and nordic) staying at Snow's nest in Waitsfield. House was warm, cozy and comfortable and we enjoyed family meals and game nights in front of the gas fireplace during our stay. Beds were very comfy, house was spotless and great views of the mountains from the back deck. We'd definitely recommend this home! Property is fantastic. Excellent owner service. What a great property. Sheila was very easy to deal with and the the whole stay was fabulous. The house is a 3 minute drive to Waitsfield and 15 minutes to Sugarbush/Mt. Ellen. Would highly recommend this property and we will be back next year for sure. Quite Pleased - No Surprises, super-attentive owner. I confidently recommend this property. Lovely, well provisioned home with a very conscientious host. Sheila is pleasant work with and provided detailed instructions, directions and recommendations (dining, etc). The house itself was spotlessly clean & well-appointed with every appliance, wifi, books, etc. We had a wonderful stay at the Snows Nest. Sheila was easy to work with, the property was clean and had everything you could possibly need while on vacation. The surrounding area is beautiful and peaceful. This was an extremely comfortable stay, we would definitely book here again when in the area. This house was perfect for us since it was up the road from the Skinner Barn. It has a nice open floor plan on the first floor and two separate large bedrooms and one smaller, great for kids. The house was comfortable, didn't feel like a vacation house but rather just like our own house. The radiant floor heating is great once it warms up. The owner was very easy to deal with and very available. The road leading up to the house is dirt/gravel, it didn't bother us, but just keep in mind if that isn't your thing. It's just a short distance til you're back on paved roads. Overall it was a great fit for us. We had a great stay in at this property in February for skiing. This home was close to the local mountains (both peaks of Sugarbush and Mad River Glen) and was perfect for our group of a few skiers. Would visit again! Many artisanal farming activities in/around the Mad River Valley; beekeeping, heirloom pig farming, dairy operations, cheese-making, falconry experience, etc. * Holiday Rates (higher) May Apply * Please contact Owner, we are responsive to requests.